Sure, VCs may be headed out of town for their August vacations, but we’re hard at work here at TechCrunch getting ready for our fall conference TechCrunch Disrupt, September 27-29 at the San Francisco Design Center Concourse. If you’re a new startup that will be ready to launch this fall, we want to hear from you. Apply to the Startup Battlefield at TechCrunch Disrupt. The deadline is midnight PST Sunday, August 8 (you have through the end of the weekend for those who want the fine-print definition of midnight). Details follow. If you’re a startup that will be ready to launch at the end of September, we want to know about you. By launch, we mean that you want to either (1) announce and enter a closed beta or (2) open to the public on stage at the conference. If you’re a startup that’s opened to the public since June 1, 2010 you are also eligible to apply. The hurdle for companies who have already been public is much higher. If your launch has been covered extensively in the press, you’re not likely a fit, because our focus is showcasing new startups and new products on stage. But make your case, and we’ll consider companies on a case-by-case basis. If you’re an existing startup or company with a new product launch, you may also be eligible to apply. The product should be a completely new line of business for you, not a new feature release—no matter how extensive, fresh or improved—of an existing product. Good example: AdBrite launched Spottt at a previous TechCrunch40 event. It was a new ad product for AdBrite, with an independent brand, site and platform. Bad example: new mobile version, new ipad version, new APIs or geo-location integration. These things are all great and important for startups to pursue. They’re just not our target for the Disrupt competition. Companies may be funded or unfunded. Companies may be from any geography in the world. In fact, we like to showcase geographic diversity. Startups may be from any sector. Yes, our sweet spot is consumer and mobile internet, but we’re thrilled when we can showcase enterprise applications, hardware, greentech and other new areas of innovation. There are no costs to apply or present, and if you’re selected you’ll receive complimentary passes to attend the event. Also, every year, people love to tell us that we need to feature more diversity on stage, especially more women founders. Help us. If you know a great new startup, please recommend them to apply to TechCrunch Disrupt ASAP. We strongly favor applications that include a short video demo. It doesn’t need to be a fancy demo, but it really helps to see your product. Due to the heavy number of applications, we may not be able to screen applications that do not include a video. Pre-emptive answer to: What happens if I miss the deadline? You may submit a late applicaiton. But we prioritize review of applications submitted before the deadline. We will continue to review all applications until we reach our target number of launch companies, likely 25. We’ll finalize our launch companies by the end of August. We have already extended offers to several new startups, so please apply for consideration to TechCrunch Disrupt ASAP. 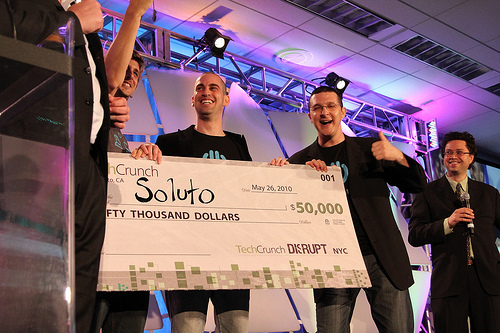 Soluto was our grand champion at TechCrunch Disrupt NY. They cashed their $50,000 grand prize, take their StartUp Battlefield Trophy everywhere they go in Tel Aviv Israel, and are gaining momentun and consumer adoption worldwide. uJam, the runner up and audience-choice favorite, is helping consumers compose, produce, and publish their own music. Check out all 22 great companies that launched at TechCrunch Disrupt NYC. What can I do if my startup doesn’t qualify? There are lots of ways to participate at TechCrunch Disrupt. If you’ve already launched or don’t get a final spot on stage, we have a high-visibility exhibitor space in StartUp Alley. Discounted rates apply for companies less than 2 years old and with less than $2 million in funding. Register online for StartUp Alley packages. We have exhibitor and sponsor packages in all shapes and sizes for companies great and small. Exhibitor packages are also available online. Contact Heather Harde or Jeanne Logozzo to learn about custom sponsorship packages. Early bird tickets are on sale through August 31. Join us.